Book Review - How Full Is Your Bucket? 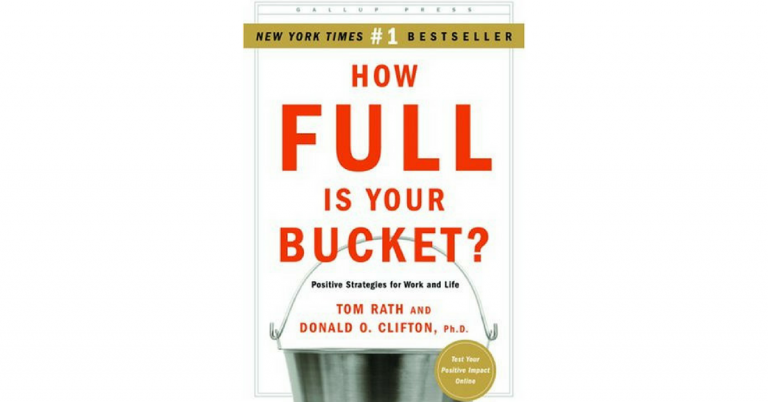 Book Review: How Full is Your Bucket? Totaling in at fewer than 100 pages, How Full is Your Bucket? is a quick and easy read for anyone working in teams or in a leadership position. The authors, Tom Rath and Donald O. Clifton, guide readers through six chapters that include research, case studies and applications of the power of positive (and negative) interactions between people. How Full Is Your Bucket? teaches strategies by using the analogy of the bucket and dipper. According to this theory, each person has a bucket and a dipper, and with positivity, you fill your bucket and the buckets of others, but with negativity you deplete others’ buckets as well as your own. Prevent Bucket Dipping – Be aware of when you are ‘bucket dipping’ and stop it, encourage others to do the same. Shine a Light on What is Right – Focus on the positive and what is going right already; this fills others’ buckets. Make Best Friends – Having a best friend (or many) at work may increase health, productivity and satisfaction. Give Unexpectedly – Look for opportunities to give small gifts or perform random acts of kindness. Reverse the Golden Rule – “Do unto others as they would have you do unto them.” In other words, be individualistic in the way you fill others’ buckets, do things that meet each person’s interests and personality. A bonus section at the end of the book contains a 23-page guide to applying these five strategies in teams and organizations, including activities and worksheets that can be printed and used immediately. How Full is Your Bucket? provides information and applicable strategies to increase positive interactions in the workplace, therefore increasing happiness, productivity and collaboration. I recommend this book to anyone looking for a basic guide in understanding and applying the principles of interacting positively. As Director of Operations at Happy Brain Science, Ayla thrives most when helping individuals and organizations to maximize their success through the application of positive psychology and neuroscience.